Oct 2005… Mister Morrow you have a mixed lipoid sarcoma, in your lower rt leg, 35 treatments of radiation later they, cut the tumor out + half of my calf and Achilles tendon, so my foot no longer works. 1-1/2 yrs. Later I still have tremendous pain and a 1 ½ w X 7’ long hole in the bone of my leg and the threat of cancer the in bone, 6 total bone biopsies that year, I had to wear Bledsoe brace all the time so my foot won’t bend. 2007 Debbie (Angel/wife/friend/life) and I decided to chop my leg off and doctors agreed, up to this time I still worked as a sheet metal project manager. My HMO covered the Cancer items, but after amputation I found out I don’t have any coverage for what’s next! 3 days after my leg was removed the insurance company refused rehab and I was forced back to work 13 days after amputation. I worked with 1 leg for 8 months, then got laid off in Oct 2008. Mid-way thru 2008, after amputation, I got my first leg, which insurance only paid $1,000. I had to come up with the rest $15,000…So I sold my 2001 Road King (tears) and boat. The leg that was recommended by (company to be un-named) was hydraulic manual and socket was wet fit suction that never fit right. Insurance sent me to sports rehab, which did not seem to understand amputee challenges. 2011 I get SSDI Medicare, finally I can go to real rehab and can afford to get new socket, But now I am 310 lbs, so I go on diet and go to Y and lose 60 lbs, I get down to 246 lbs and get new socket, that is still not comfortable, they say I will shrink into it, so off I go for 32 visits to rehab. Socket is terrible and leg is hard to use with socket hurting, my cardio is down from no activity, 6 to 8 months and all I can do is walk with 2 arm crutches for 50’ and then die!! 2013 I am about over this!!! Then I see Steve Chamberland and 50 Legs.org on TV, and reach out to say what a great job to help kids, and think I would like to help .We go back and forth with messages and calls and we get to be fiends, He is always pushing me to go to POA and Stan, but my insurance won’t cover. Jan 10, 2014 a Friday, Steve calls me and says he is tired of me not getting the right needs and he is taking me to POA Monday and NO is not in this conversation. So Monday Jan 13, 8:30, I met Steve at POA and we went thru that LIFE CHANGING DOOR, I was blown away at the facility and then by Stan his team and also the other amputees, Life was back!!!!! That day Stan and his team, casted and fabricated on site, my new socket, 3hrs later I was in a socket that fit like a leather glove and standing on my old leg and walking down parallel bars no problem I thought, but it was not good enough for Stan and Steve, they said I need a C-Leg. I am sitting there in awe and thinking my Insurance won’t cover and I know they cost $60,000 +. I look over and Stan and some guy in a wheel chair are talking and pointing at me, the guy in the wheel chair rolls over and says, Hi! 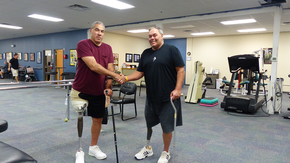 I am John and Stan tells me you need a C-leg, and says He is donating his 3 yr. old hardly used (as in worn twice) to me cause he just got a new one from his insurance, WOW I was floored!!!! So Stan puts the C-leg on my new socket and I instantly fall in LOVE, it was unreal, a socket that was comfortable and a leg that would get me where I should have been 4 or 5 yrs. ago. “I saw GOD that day“, as the saying goes. The next 4 weeks were AWESOME, I have gotten up to 100’ft+ in walking, 6 to 8 hrs. a day of wearing the new leg. I wake up wanting to put leg on and to walk. 50 Legs, Steve, and the POA team, having given me a gift beyond words or money. They have given me my Life, Wife, and the chance to thrive. Steve Morrow and Family wrote a poem in 2007, just before amputation. Orlando, FL on a Saturday night. When along came a beautiful angel, that asked me to dance. A start of a relationship was well on its way. Stepping on my angel’s toes. But my angel would not complain and wouldn’t let anybody know. being strong and being my wife.